I am a great advocate of natural skincare. Having suffered from acne for many years in my late teens and after the prescribed tablets and greasy creams left me worse than I had started, I sought out natural alternatives. Naturally, I am always keen to hear of new brands changing the way we view our skincare regime and making a real shift in customers attitudes. None more so than Melanie Blane, founder of White Rabbit Skincare. I was lucky enough to interview Melanie and hear more about the ethics behind her brand, her own trauma of a teenage skin condition and the real reason you shouldn't shy away from natural plant based ingredients. 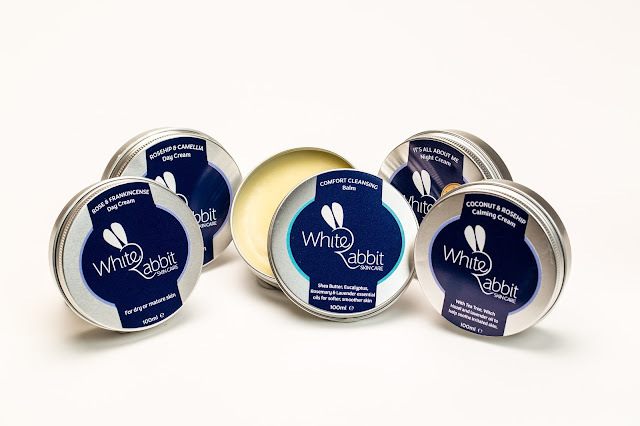 White Rabbit Skincare is a luxury skincare brand, created to address the need for high performance but naturally based skincare products. Our range stands out as 100% vegan and cruelty free, certified by PETA, and all our products are carefully made in small batches, in our unit in Ayrshire, Scotland, to ensure the highest quality and freshness. We are also deeply passionate about the environment and encouraging others to live a greener lifestyle - hence why most of our packaging is recycled/recyclable. "100% vegan and cruelty free, certified by PETA"
Q. Why did you start your brand? I was diagnosed with psoriasis as a teenager (after an initial misdiagnosis of Scabies...! ), and didn't want to use steroid creams as prescribed by the doctors - psoriasis is often a hereditary and stress-induced skin condition, so even if these creams were effective (minus all the negatives), they aren't going to cure it. Moreover, said creams are completely packed with chemicals (fun fact: your skin absorbs 60% of what you put onto it into your bloodstream!) and more often than not are tested on animals. I decided to start using natural products such as coconut oil and shea butter on my skin and did notice a remarked difference in the symptoms (dryness, itching, sore skin). I then bought a little 'Make your own skincare' book, and started making my own products, such as lip balm, body butter and so on - what better way to guarantee the origins of a product and what it contains than to make it yourself? People started to take an interest in my products, and the rest, as they say, is history! Q. What does ‘Cruelty Free’ actually mean and why is this important to you as a brand? To me, Cruelty Free means that the ingredients and products themselves are not only not tested on animals, but also free from any animal-derived ingredients (beeswax, lanolin etc) - basically, animals are completely removed from the entire equation! There are so many plant-derived ingredients out there that are astoundingly effective that I can't fathom why animal ingredients need to be involved in the beauty industry at all nowadays. Q. Using only plant-based ingredients your products are also suitable for vegans, how important was this to you when launching your brand? Very - because not only did I want my brand to align with my own beliefs, but I wanted to make our products available to everyone, as well as helping promote the benefits of plant-based skincare to those who perhaps might not have considered it previously. Q. Why should people consider using natural ingredients over the high street options? 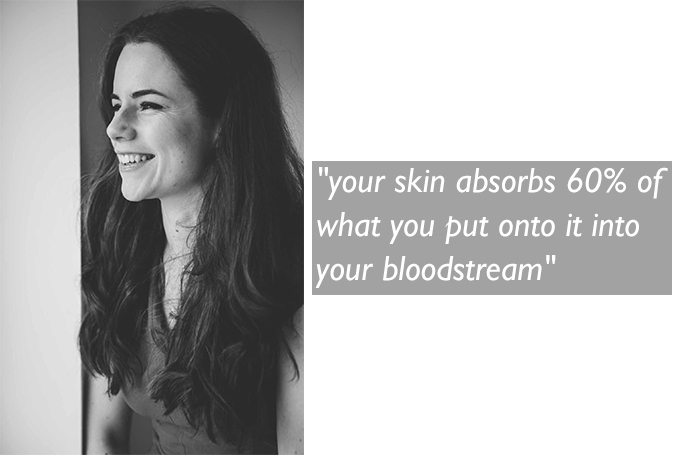 As I mentioned earlier, 60% of what you put on your skin is absorbed into your bloodstream - if this isn't a good reason to use products containing natural ingredients, I don't know what is! Too often products sold on the highstreet claim to contain natural ingredients but these are usually in the minority in amongst a load of filler/chemical ingredients and artificial fragrances and colours. A handy tip for reviewing the ingredients in a product is to check how the ingredients are listed: the majority ingredient will be listed first, with the least used ingredient listed last (so in our products, this would be essential oil, as we only need to use a few drops in each product). Q. What’s your top skincare tip? Double cleanse! Especially if you wear a lot of makeup. The first step is to remove makeup with a gentle oil cleanser or micellar water designed for makeup removal, then follow up with a cleanser for soothing, rejuvenating effects, such as a cleansing balm. Voila, naturally glowy, cleansed skin!